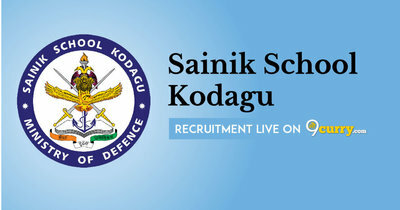 Sainik School Kodagu Recruitment 2019: Sainik School, Kodagu / www.sainikschoolkodagu.edu.in is conducting recruitment processes to fill 9 vacancies. As of now, there is one recruitment drive going on for TGT, Counsellor & Other Posts. Sainik School Kodagu Recruitment 2018 - Job notification for PGT (Physics) Post in Sainik School Kodagu, Karnataka on Regular Basis. Applications are invited by Sainik School, Kodagu on or before 15 Dec 2018 for 1 vacancy. Sainik School Kodagu Recruitment 2018 - Job notification for PGT (Physics) Post in Sainik School Kodagu, Karnataka. Applications are invited by Sainik School, Kodagu on or before 12 Jul 2018 for 1 vacancy. Sainik School Kodagu Recruitment 2017 - Latest job notification for 23 General Employee, Ward Boys, MO, Asst Master & Other Posts in Karnataka on Contract Basis. Applications are invited by Sainik School, Kodagu before 30 Jun 2017 for 23 vacancies.